As pressure rises on plants to improve productivity and equipment reliability levels, seals and gaskets are being called upon to provide even better performance. Their challenge no longer is simply to prevent leaks but also to play an important role in the life-cycle management of the plant. Selecting the right seals for your process is as fundamental as selecting the right pumps, valves or mixers — all of which, of course, rely on sealing technologies for their efficient and environmentally sound operation. Indeed, as pressure rises on plants to improve productivity and equipment reliability levels, seals and gaskets are being called upon to provide even better performance. Their challenge no longer is simply to prevent leaks but also to play an important role in the life-cycle management of the plant. He says customers in the chemical industry are focusing more and more on the reliability of the entire plant, “not just your product.” At the same time, “they are looking for more support from their suppliers in the areas of technical expertise and know-how specific to their plant — not just specific to your product,” he adds. Plant operators now are concerned more with the performance and reliability figures of “asset classes” — the entirety of valves or pumps in a plant, for instance, rather than of an individual item of equipment. Seal suppliers dealing with multiple customers are in a good position to offer sound advice on what are the best practices to adopt for these asset classes, says Boyson. A similar point is made by Tom Bennett, product manager with Flowserve in Dallas, Texas. “We can suggest better ways of running equipment to improve mean time between repair, seal life and so on,” he says, adding that the customer might not necessarily want to run its plant in that way, though. The consequence of such customer demands on all seal suppliers has been a constant upgrading of seal and gasket designs. Around the middle of last year, for example, Flowserve launched the GCX single mechanical cartridge seal for ANSI/DIN chemical pump applications on multiple process fluids (Figure 1). Instead of the elastomeric components used in other seals, the GCX features flexible graphite-foil secondary seals to handle the often-aggressive nature of multiple chemical environments. 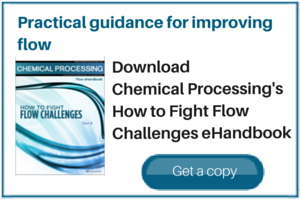 Batch processing and intermediate chemical pumps also often handle multiple-pH-level products as the process progresses, during which time there is no opportunity to change out the secondary seal. “Because it works across applications, the GCX allows plant managers to standardize inventory and reduce costs,” notes Mark Fallek, Flowserve’s vice president of marketing. John Crane, Morton Grove, Ill. and Slough, U.K., also is investigating the use of diamond coatings. The company has had a long-running collaboration with Advanced Diamond Technologies (ADT), Romeoville, Ill., to develop and commercialize ultrananocrystalline diamond (UNCD) as a means to improve the friction and wear characteristics of mechanical seal faces. (UNCD is the trade name for thin-film diamond material grown through a patented chemical vapor deposition process developed at Argonne National Laboratory, Argonne, Ill., and licensed by ADT in 2004.) “We are now looking at lead users and doing some work in the field with interesting applications,” notes Rick Page, vice president of marketing for John Crane Americas.That ongoing development project is one for the future, but Page sees immediate impact for three new product lines the company recently introduced. Within that platform, the Type 7828G gas-lubricated double seal uses dry nitrogen as a barrier gas and John Crane’s patented spiral groove technology to separate the primary seal faces. For duties requiring reduced barrier-gas consumption, the hybrid 7828GD offers a combination of non-contacting faces inboard and dry contacting faces on the outboard seal — but still in the same hardware as the 7828G. Similarly, the Type 7848D and Type 7848W use identical hardware while offering, respectively, proprietary face materials to run in a dry nitrogen barrier with virtually no wear, and a conventional liquid lubricated seal intended as an alternative to running dry and non-contacting. A common operating problem encountered with many single outside-mounted dry-running mixer seals is audible running noise or seal face squeal — a problem John Crane is addressing with the launch of the Type 32i seal (Figure 2). The primary ring of this dry-running top-entry mixer seal attenuates the generation of a vibration signal associated with dynamic face contact squealing. The result is a continuously self-adjusting interruption in resonance and quiet operation, making the seal particularly suited to interior plants typical of the pharmaceutical and fine chemical industries that have to meet OSHA workplace noise regulations. Another industry-specific seal launched last year by John Crane is the HTC (high temperature corrosive) metal bellows seal (Figure 3). This is designed for the increasing numbers of refineries now processing high-sulfur crude oils. These sour crudes contain organic acids that, when refined at high temperatures, create naphthenic acid, which is extremely corrosive to certain metals. Traditionally, seal manufacturers have combated this acid attack by coating the exposed components in high temperature welded seals with various platings such as chrome or even gold. But these have been found to only delay corrosion as the coating can flake off, exposing the base metal. “The holy grail,” says Page, “has always been an all-Inconel metal bellows seal for these sour crude applications. The highly engineered HTC meets that and has solved a lot of issues in the refining area.” Available in two options, Types 604HTC and 609HTC, the new API 682-qualified seal uses a complete Alloy 718 metal bellows construction that’s highly resistant to corrosive attack. More importantly, the patent-pending face retention design maintains face flatness across the full temperature range, up to 800°F. Also last year, Flowserve introduced the QBQ LZ contacting face mechanical seal for refinery and petrochemical duties on light hydrocarbons (Figure 4). The problem with this sort of duty is the natural tendency of fluids like ethane, propane, butane, ethylene and propylene to flash off at ambient temperature and pressure. Such vaporization in the seal leads to dry running and premature failure. Flowserve’s solution is to alter the temperature and pressure dynamics on the seal faces with its Precision Face Topography technology. This technology involves laser machining a patented wave pattern onto the seal face. The dynamics created by the wavy design mean that fluid pressurizes on the wave peaks at levels several times higher than the pressure in the seal chamber, driving vapor back into the liquid. Vaporization is pushed as close as possible to the inner diameter of the seal, leaving the faces of the QBQ LZ primarily wet with stable flashing and little seal-generated heat. While seal manufacturers have shown themselves adept at engineering seal designs to meet specific applications such as those above, most plants still want to standardize on off-the-shelf models wherever possible. In part this is driven by the need to meet design standards like API 682, or DIN and ISO equipment standards, but it also reflects the desire to minimize inventory. Single mechanical seals, for instance, still are in widespread pump use, with dual seals the norm for hazardous duties. However, gas seals, too, are becoming more standard technology (see his article in CP, December 2006), according to Boyson. “Plants are moving away from single seals because of possible emissions problems,” he says, “and are looking for a low-total-cost alternative, which is what a gas seal offers.” Chesterton’s 4400 TwinHybrid gas seal fits standard process pumps with no modifications required. Its face design is said to put two sealing interfaces in a single seal ring set, effectively offering the simplicity of a cartridge single seal with the security and reliability of a dual configuration. Flowserve’s MD, MW and ML “lift off” gas mixer seals are finding increased application in the pharmaceutical sector where any possible particulate contamination from seal faces has to be avoided at all costs, says Bennett. One of the more recent moves in the seals market was this April’s acquisition of the Syntron RP mechanical seal line from FMC Technologies, Houston by Garlock Klozure, a division of Garlock Sealing Technologies of Palmyra, N.Y. Although a relatively small product line, the Syntron RP adds to the wide range of sealing solutions from Garlock, which includes mechanical seals — such as the XPS, touted as the “first serviceable-in-place mechanical seal” — and some interesting recent developments on the packings and gasket front. Unlike conventional seals that contain a single set of sealing faces, the XPS cartridge seal, introduced last year, houses a series of sealing elements, some deployed and others poised for future use. If a problem arises, not-yet-deployed elements can be brought into use in a matter of seconds, allowing the process to be continued with minimum interruption. With the rebuild kit available with any XPS, the seal also can be fully reconditioned on site in less than an hour, without any need to send it back to a repair shop to get faces relapped or parts rebuilt, says the company. Also launched last year, Garlock’s Hydra-Just sealing system (Figure 5) aims to replace mechanical seals in many pump applications. “Hydra-Just is a direct competitor to mechanical seals. It is more of the genre that might be thought of as a typical compression packing — but it’s made up of flexible graphite with flow control rings inside the set, so basically it’s a hybrid between the traditional braided type packing and the mechanical seal,” says Jim Drager, engineering manager. Another innovation from Garlock last year was its proprietary new gasketing material, Multi-Swell. As the name suggests, this material creates its own load when it comes into contact with oil or water, thus eliminating one of the most common causes of flange gasket failure — low loads. “It is a very dynamic marketplace right now,” as Boyson says, but one in which the seal manufacturers are clearly meeting those new challenges with more and more innovative products and solutions.